I have my phone set up to upload every photo I take with my phone to Google+ whenever my phone is connected to wifi. A fairly new feature has popped up on Google+ that I am a big fan of. It is called Auto Awesome. What Auto Awesome does is look at your photos and determine if any of them can be either stitched together to make a panorama or stacked to make an animated gif. I find myself now taking pictures and hoping that after they are uploaded to Google+ that Auto Awesome can then turn them into animated gifs or panoramas. The animated gif feature is pretty reliable but I have found that the panorama feature doesn't kick in that often. During my recent trip to Michigan we took a boat ride on Lake Leelanau. I took a several pictures of the shoreline, some in color and some in black and white. Auto Awesome grabbed two photos, one in color and one in black and white and stitched them together. I love the effect it created. I wish that would happen more often. Several months ago I made plans to visit my family in Michigan in early October. I don't get up there a lot so when I do I try to arrange my trips so I can experience different seasons. This time I went up in early October. I hadn't been in Michigan in October since October of 1985. 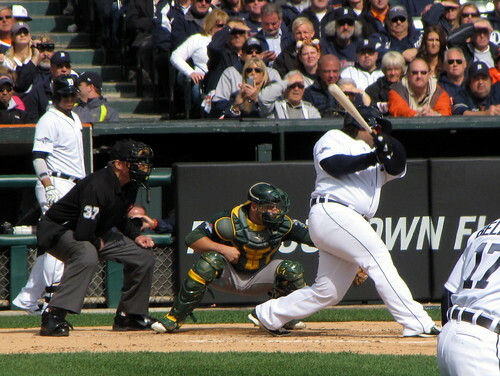 A couple of weeks before my trip the Tigers clinched their divisional title. On a whim I visited the team's website and checked on tickets for the first home game of the series that was to be played on October 8th. Tickets must have gone on sale that morning because all the best seats were still available. I knew if I snatched up two tickets my dad would be willing to go so I did just that. 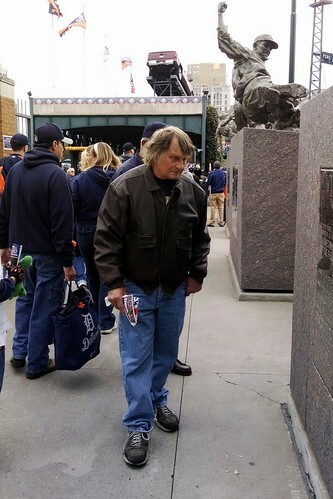 My dad has a second house in Lewiston, MI and he suggested we stay there the night before the game because that would put us thirty minutes closer to Detroit. Sounded reasonable to me so we did that. That evening I had an amazing cheeseburger at Talley's Log Cabin Bar and a few Jack and Cokes. Why Jack and Coke? Because that part of Michigan appears not to know that there are beers in this world not made by Anheuser Busch or Miller. I think their motto is "If it's not piss yellow we won't serve it to a fellow." The game started at 1 pm so we awoke at 6am, had breakfast and we were on the road by 7:30. We made good time and when we got into the city I had my directions ready to go. We were going to get off I-75 about a mile north of the ballpark and take surface roads to an area with parking lots that I thought would work. We got into the right lane a little early and...it ran out on us and before dad could switch lanes we were exiting onto another freeway that was going west rather than south. Uh oh. I told dad to take the next exit and we ended up on another freeway going north. We took that first exit which dumped us onto a surface street. We parked in some anonymous parking lot for an old office building. I grabbed my phone, found where we were and, praise Jebus, we were just a few blocks from the road I was shooting for. We were too far north but we could get there easily and follow the road south to the parking area. We did that and were sitting in our seats by noon. 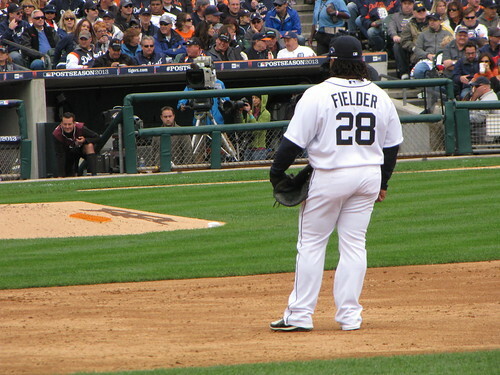 When the Tigers moved from Tiger Stadium to Comerica Park I was one of those guys who pissed and moaned about the move. 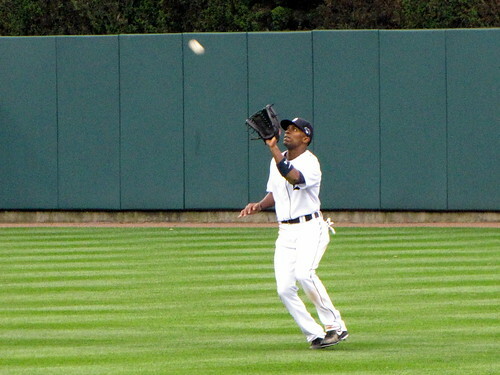 After visiting Comerica Park for the first time I can say I was wrong. 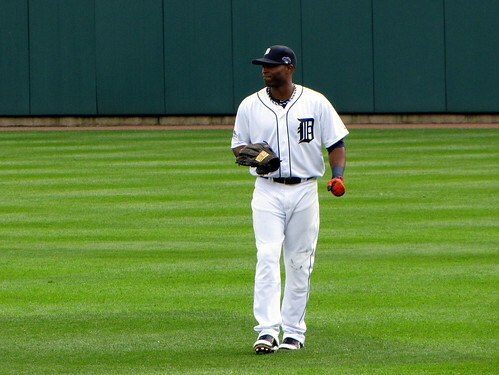 Comerica Park is an amazing facility. Tiger stadium had the history and a certain atmosphere but as a destination it wasn't that great. 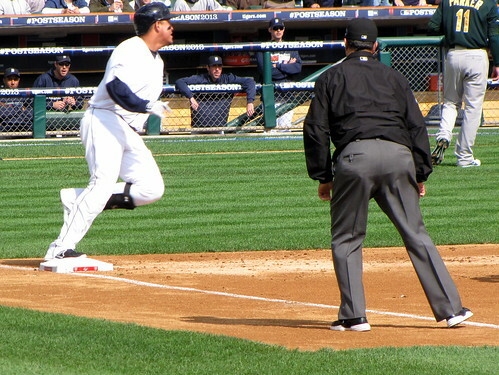 Comerica Park offers great views for the fan there to see the game and only the game and it also offers an experience for the casual fan. It does that while pleasing both and not short changing either. That can't be easy to achieve. A couple months back Melanie and I watched an excellent drama on BBC America called Broadchurch. It's a depressing murder mystery involving the death of a boy in a small seaside town in England. It starts out depressing and goes downhill from there. It's excellent but it's brutal. Like life. I did some searching on where it was filmed...well, I checked the Internet Movie Database, I guess that counts as searching. Some amazingly beautiful cliffs feature prominently in the story and are seen in the background several times. 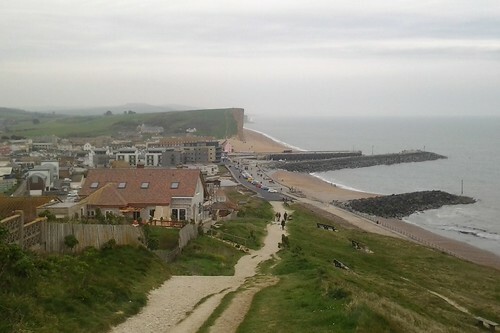 These cliffs and the small seaside port are in a town called West Bay. You can see the location below. I found some photographs of the cliffs on Flickr. Here you can see what really grabbed me about these cliffs. 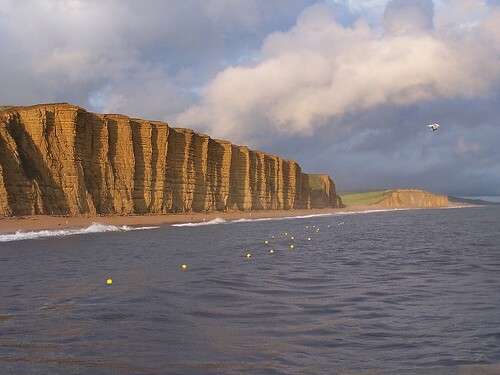 They are high and shear and tower over the ocean but you can walk up there from the small town of West Bay. A view of the cliffs from the water. You can see the cliffs rise and fall. It must be an amazing day hike. 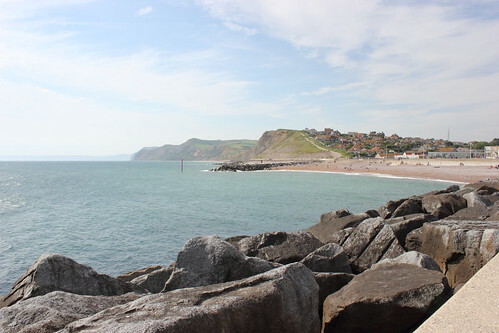 A view of the West Bay area from a bit further west. I think this was taken at the base of the cliff you can walk up from the village. A closer view of the cliffs with a hiker ascending. 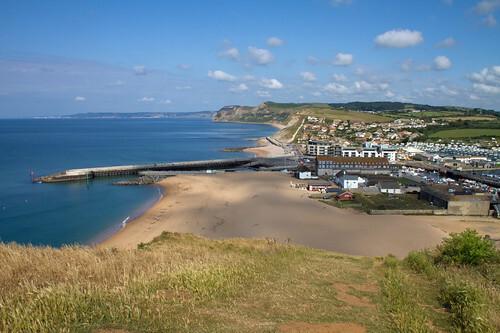 This is the village of West Bay. 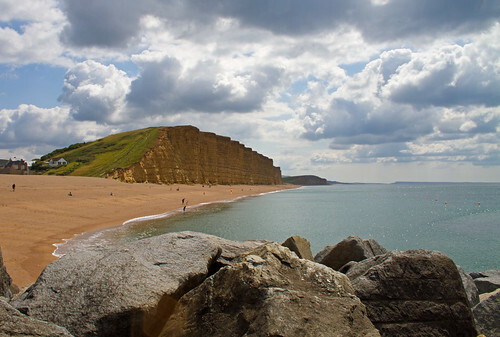 This is the view we saw several times while watching Broadchurch. Great, just what I needed, another place in England I want to see. So tomorrow is National Greasy Foods Day! Hmmm what should I eat? The lead singer of Gwar answered this way. Brilliant. Since we were in Detroit for the Tigers game I had my open for any ruins to photograph. 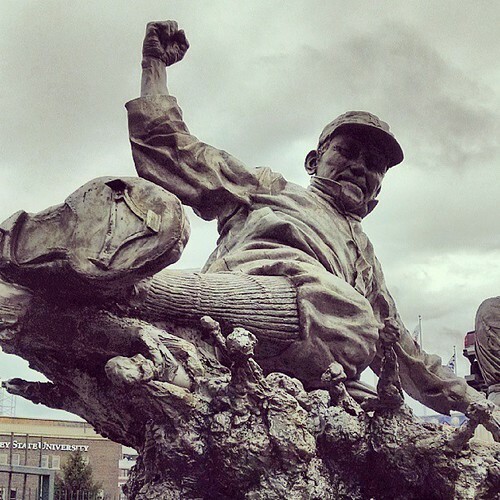 There were more than I thought there would be near the ballpark. 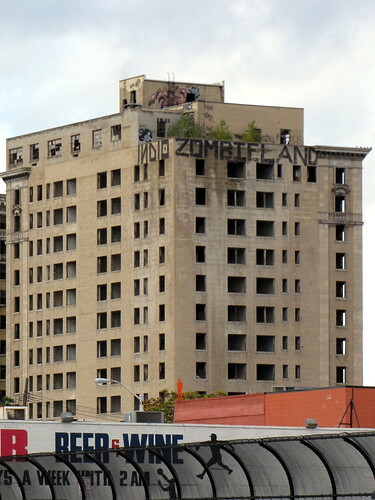 This building here stood out. 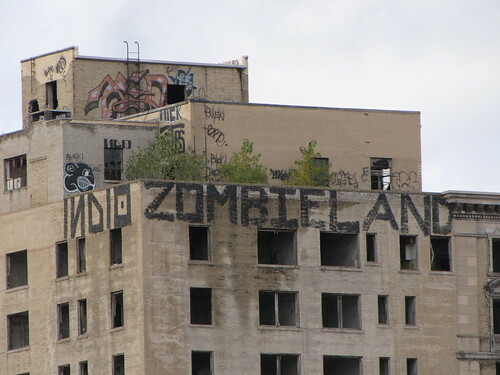 It's about twelve stories tall and has foliage growing on the roof and someone painted the word zombieland across the top. I found an even better picture by someone else here. Just west of my Mom's house is an overlook that gives you a view of Lake Leelanau and Grand Traverse Bay. I discovered it while trespassing a few years ago. It really is a great spot and it was a nice surprise when I found it. Whoever owns the land has mowed and put in a picnic table in the area with the best view. I went up there tonight and took this panorama of the sunset. 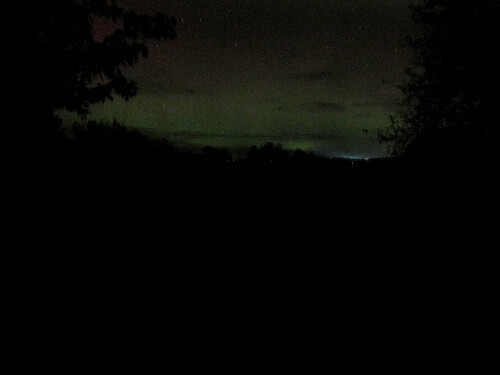 You can see Lake Leelanau in the bottom right corner.